Jill Thompson, MPA, is the Membership/Communications Manager for two international membership associations headquarter in Indianapolis. In May of 2011, Jill graduated with a Master’s in Public Administration (MPA) from the Martin School at the University of Kentucky where she focused on Non-Profit Management. 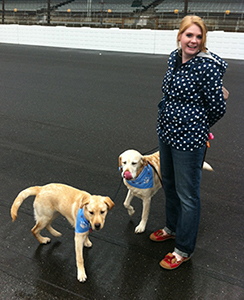 Jill volunteers together with her 10 year old lab, Nelly, at many of Paws and Think’ venues. Over the past six months, Jill has taken on the role of Paws and Think’s Event Committee Chair facilitating several successful events such as “Paws and Pasta” at Milano Inn and “Ales and Tails” at the Sun King Brewery. In addition to working full-time and volunteering, Jill enjoys traveling (she speaks German), shopping and reading. Most of all, she enjoys sharing her dogs with others.